Today, we begin a new series of posts designed to help all of you who would like to learn to sew, or who have already begun taking small steps in that direction. We will start with something very basic: the sewing machine. Maybe you are fortunate, and you have been given a sewing machine that someone no longer uses. That’s wonderful! Be sure to get the attachments and the operating manual. And get the previous owner to show you how to thread it, make a bobbin, and make a stitch. But if you need to purchase a sewing machine, you may feel a little overwhelmed when researching the variety of new machines available to the home sewer today. And you may wonder if you will have to take out a second mortgage in order to buy a good sewing machine. You can find new machines priced from $50 to $12,000! The good news is that you can buy a good basic machine for not much money. So here is our recommendation: the Brother LS-590. Hancock Fabrics sells this nice little workhorse for $100, or a little less if you catch it on sale. It’s a basic sewing machine with several built-in stitches, most of which you will never use. But you will use the straight stitch, the zig zag stitch, the buttonhole setting, and a few others. 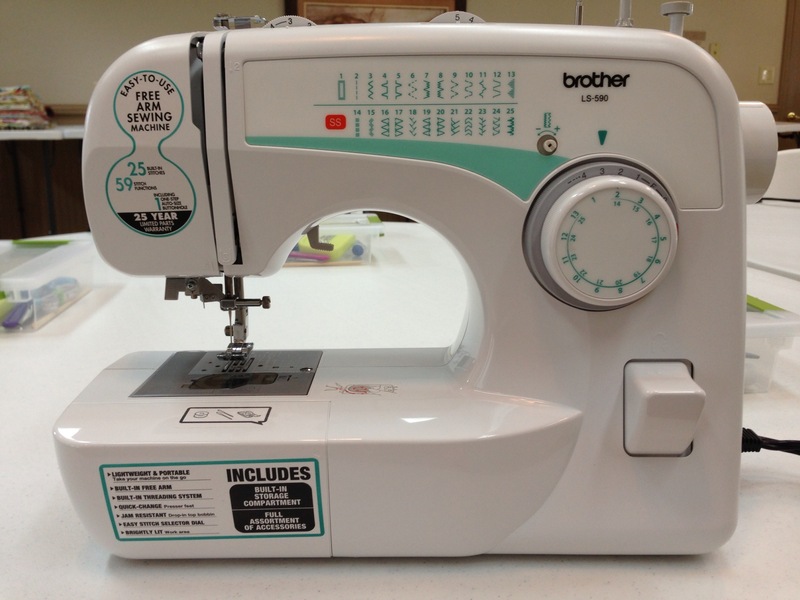 This is the machine that our students use in our Beginning Sewing classes here at Golden Needles Studio. We have used seven of these for over a year now, and given them quite a workout. These little beauties will sew a variety of fabric weights without any problem. Spend about a hundred bucks, and learn to sew. You can always upgrade to something with more bells and whistles down the road, after you know what kind of bells and whistles you want. Back when we were setting up our classroom, we we were prepared to spend between $300 and $400 each on basic sewing machines for our studio. That was when I ran into a friend of mine who spends a good bit of her time teaching Haitian orphans to sew in open-weather tropical conditions; when I asked her to recommend a good sewing machine for our studio, this was it. The Brother LS-590 is what she uses in Haiti. That sold us, and saved us a lot of money. The size of this sewing machine is about as small as you would want to go. I’ve seen some smaller machines at Hancock’s. Singer was one of the brands, I think, and they were a little less expensive. But I would not trust a smaller machine to do the work that this one will do. Brother has a few other models that look like they are almost the same as this one: XL-36001, XL-2610, XL-3750, and XL-2600i are all similar models in the same price range. I feel quite certain any of these would be perfect for the beginner. Below, see a short instructional video, explaining a few of the features of the Brother LS-590, which would also apply to other machines. The video also shows how to thread the machine and how to make a bobbin. So take the plunge. Buy yourself a sewing machine. Then meet us back here next time when we will talk about the basic tools you need for sewing. After sewing for years with a Singer Touch and Sew, I bought a basic Baby Lock. (If you are interested, I wrote a little about that decision in a recent post called “An Old Friend and a New One.”) But I knew when I bought my basic Baby Lock that I would be looking for something else in the not-too-distant future with a few more features. So, one of my main purposes at the Original Sewing and Quilting Expo in Atlanta a couple of months ago was to look at every sewing machine on display, and decide which one would best suit my needs. I was on a mission. I tried Brother machines, Bernina, Viking, Janome, Juki, Baby Lock, and Pfaff. I skipped the machines with embroidery capabilities; I didn’t want to spend the money required for a feature that I knew I would hardly ever use. A funny thing happened when I got to the Brother booth and sat down to do a test-drive on their “Project Runway” model. I felt like I had just sat down at home in front of my Baby Lock “Grace.” The guy in the booth told me that Baby Lock sewing machines are made by Brother, and that my Grace and this machine were basically one in the same. Alrighty, then. After a really wonderful weekend in Music City, I unloaded my new machine as soon as I got home, set it up in my studio, and got out the all-important owner’s manual. Almost three months later, I’m still pulling out the manual and learning new things. While I am not a quilter, at times I need to be able to sew through a thick layer of fabrics without worrying about skipped stitches or stalled-out feed. But I also want to be able to sew thin, delicate silks smoothly and accurately. My new Pfaff has not let me down. The IDT (integrated dual feed) system has been key. It is a built-in option that is ready to go with one pull on the IDT, which stays tucked away when you don’t need it. My Pfaff has a beautiful and reliable stitch. Threading it and making bobbins is a breeze. You can even make a bobbin through the needle, if if runs out in the middle of a project. (This is the best news for someone who used a Singer Touch and Sew, with that fantastic automatic bobbin winder, for more than three decades!) The buttonhole attachment, which I used for the first time last week, works like a dream and makes beautiful buttonholes. So my old Touch and Sew, which I had set up with a treasured special attachment to use for making buttonholes after I bought my Baby Lock, is becoming more and more obsolete in my studio. Other features I love are the automatic reverse, the automatic thread snips, and the pivot-height option on the presser foot. There are so many more options I have not yet tried. My Pfaff has a large graphic screen to display all the programmed info for a chosen stitch, and there are more than 200 decorative and utilitarian stitches. I used number 49 this morning to create a decorative bartack to reinforce a pocket seam. 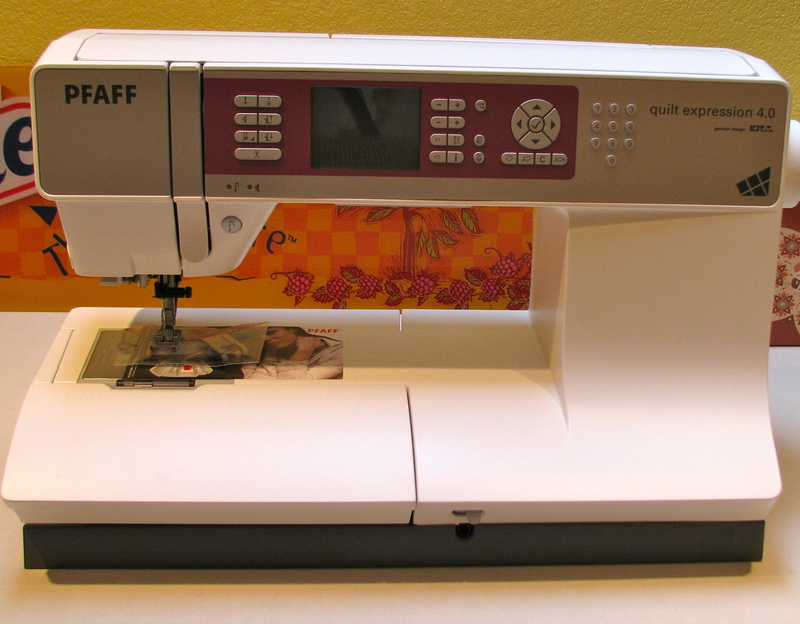 I would recommend this machine to anyone who sews a lot. Although it is called “Quilt Expression,” it is not just for quilters. Those of us who love to sew clothes need this type of versatility. I don’t do much home decor sewing, but this Pfaff would be perfect for those who do, because of the same great features that make it so wonderful for fashion sewers and for quilters. Okay, enough blogging. I’ve got a lot of sewing to do!